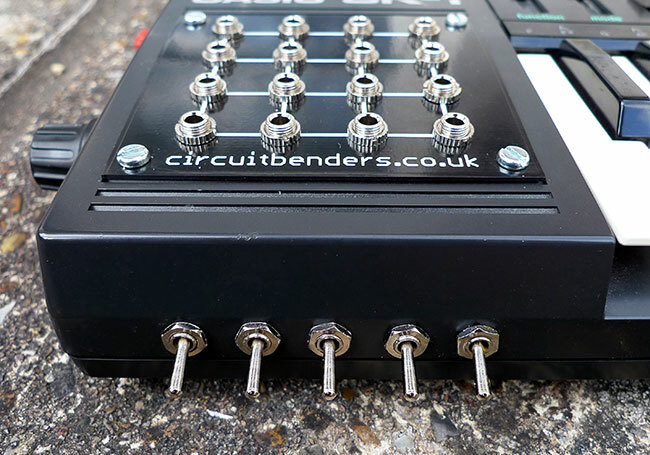 Polyphony Drop Switches - These controls consist of five switches on the front of the unit which can individually turn on/off one voice of polyphony (the sk-1 has 4) each or mute the percussion. This is useful for thinning down a huge wash of sound, isolating one voice which is producing a particular sound or removing an individual voice from the overall output that may be affecting a loop. Patchbay - This consists of 20 x 3.5mm jack sockets that can be linked together using patch cables. There are 16 in the main patching area that replaces the speaker, and another 4 in the area above the logo. Each connection made produces different effects including all kinds of sample destruction, distortion, chopping, sample splicing, ring modulation, bit crushing and alien warping of both the sampled sounds and the preset sounds. Connections can be made at any time and often have completely different effects depending on which sound is being used. The patchbay method allows hundreds of different effects to be produced with single or multiple patching cables. Installing the patchbay means that the internal speaker must be removed from the machine but the audio output jack is still fully functional. 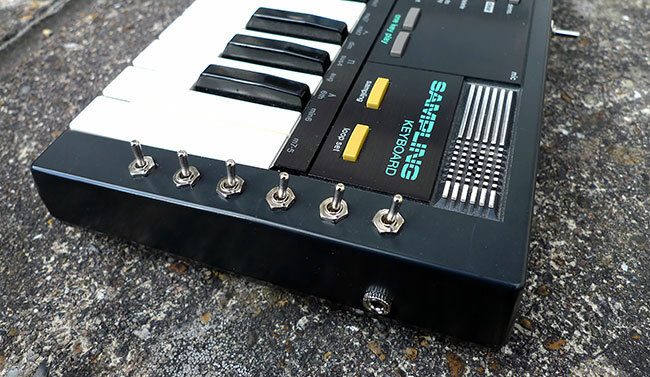 Patchable Switches - These are the two switches and their associated pairs of sockets above the 'Casio SK1' logo. Each switch turns a connection between its associated sockets on and off. This means that you can patch a switch in line with a patchbay connection, and turn that connection on and off with the switch instead of having to remove or repatch cables..
6 Alteration Switches - These control effects that are either useful to have available without patching or are not available using the patchbay. These switches are very effective when used with the auto-accompaniment features to create all kinds of drum fills, glitching loops and disturbing lounge music. Soft Reset - This is the red push button on the left of the unit. In the event of a lock up / crash this button will usually reset the machine without having to turn it off and losing any stored samples. 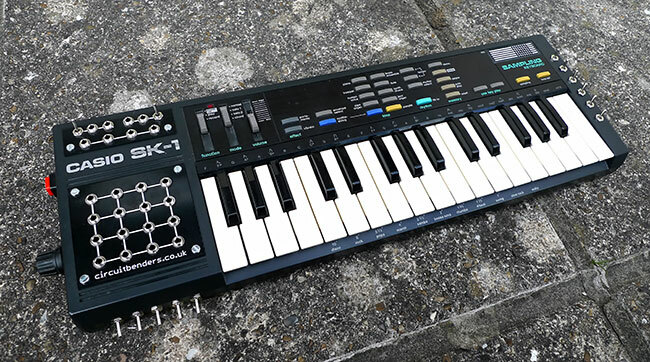 For an extra £10 we can install a trigger input for the 'one key play' function of your SK-1. This enables you to trigger the SK-1 sequencer exactly as if you were pressing 'one key play' using any drum machine with a 'TRIG' output. We have tried it successfully with a Doepfer DIN-Sync MSY2 clock output, Kawai R-100, Roland TR707 / 626 and a Boss DR-110 and it also seems to work with the Gate outputs of MIDI-CV converters. 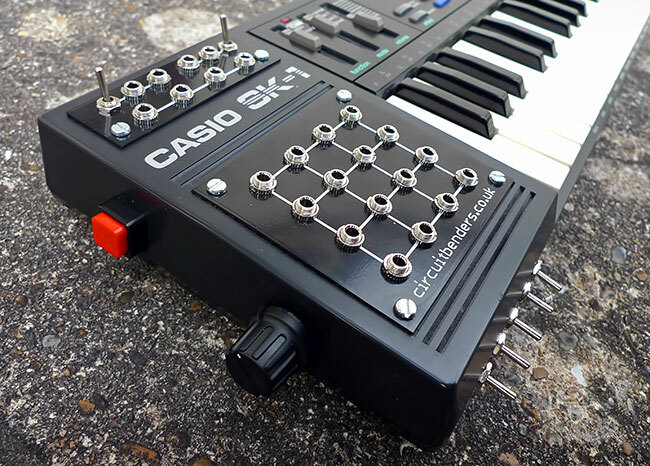 This mod allows you to sync up your SK-1 with your MIDI sequencer tracks without getting a full on MIDI retrofit. This optional pitch knob and associated switch controls the clock speed, and therefore the pitch of the unit. The switch is to change between the standard pitch, so you can actually play in tune if you want, and the pitch controlled by the knob. The reclocking knob is the knob you can see on the left hand side of the machine that can be seen on the main photos above. Below is a demo showing some examples of the effects achievable with the reclocking knob. If you want your SK1 modded get in touch using the CONTACT form.